Holds a vacuum: 28 in. Hg (711 mm) for 24 hours. 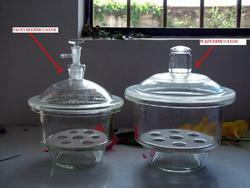 “Teknik Desiccator with Lid, Vacuum, with Stopcock. Borosilicate 3.3 glass. 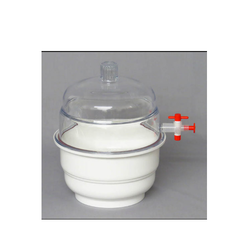 Desiccator Plain, with knobbed lid , ground flanges neutral glass, with porcelain perforated plate.